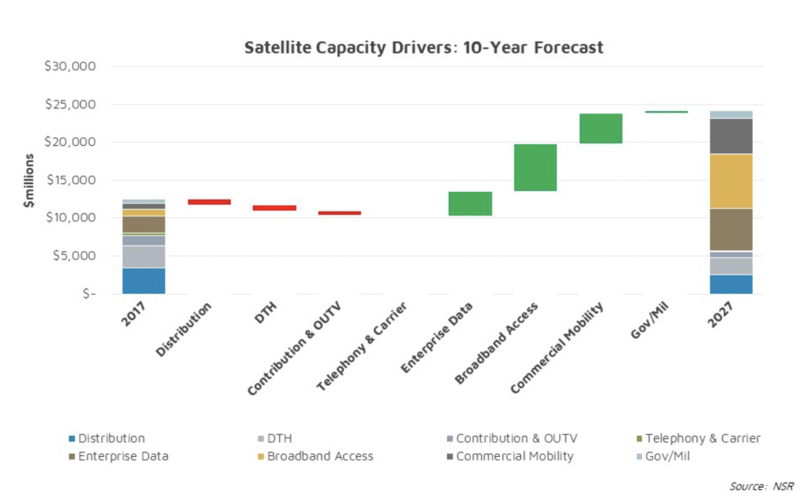 In these times of declining revenues and uncertainty, satellite operators are very cautions when choosing their future strategy and committing to large CAPEX investments (i.e. reduced number of GEO Satcom orders). With the current pivot towards new revenue drivers and the emergence of new architectures, technologies and business models, operators are in front of one of the most challenging times with respect to fleet planning. What is the optimal mix of FSS and HTS assets to continue generating revenues from legacy applications like video while getting ready for future growth on data verticals? While HTS attracts the hype and promises rapid revenue growth, the truth is that today, FSS, and most specifically video, continues to be the bread and butter of satellite operators. According to NSR’s Global Satellite Capacity Supply and Demand, 15th Edition report, cumulative satellite capacity revenues over the next 10 years will surpass $189 billion, with widebeam FSS still driving 53% of these revenues. How should satellite operators balance growth and revenues? Sources of demand for satcom are evolving at an accelerated pace. As media platforms are less reliant on satellite to reach customers and distribute their content, growth in traditional video is diminishing. On the other hand, declining costs per Mbps, advanced ground segment, innovative business models and the insatiable demand for connectivity everywhere, anytime unlocks solid growth for data services. Despite the current challenges for growing revenues, NSR is optimistic these applications will drive impressive opportunities moving forward with capacity revenues growing at 6.8% CAGR in the next 10 years. Capturing sustainable growth in these emerging applications requires an HTS play. A growing number of operators are incorporating HTS plans as it is increasingly clear that growth will come from this architecture. Having said that, one cannot ignore the potential that is still available on FSS with a large base of revenues, albeit the long-term sustainability of an FSS-only operator could be questioned given pricing and revenue negative growth prospects. Another key aspect that drags the transition to HTS is the need to adapt the organization to the new architecture. Widebeam offers established and proven business models with long-term deals, a rooted network of partners, well-known financial schemes and routine technologies. However, adopting HTS means entirely re-thinking the way the company operates. Multiple early stage deployments of HTS have had disappointing results as the organizations adopting the architecture were not ready. The customer profile changes radically, and so do the sales channels. Organizational structures and asset planning need to be in sync. Several HTS payloads have been slow in attracting customers as the operators underestimated the effort to develop sales channels. Similarly, network management for a widebeam satellite is much simpler than for an HTS satellite. Dealing with hundreds of beams and tens of thousands of terminals is certainly not easy. The investment and the set-up time for ground segment is significant, and experience tells that operators tend to underestimate this. Furthermore, the investment profile for HTS also diverges from FSS as CAPEX requirements are usually higher and investors should expect smaller EBITDA margins. In order to navigate these turbulent times, operators have more options than ever when designing their future satellites. Each actor needs to find its own balance between CAPEX exposure and willingness to venture into new markets with every single satellite requiring its own business plan. Even with declining revenues, widebeam can still offer profitable opportunities when cost efficiencies are achieved. Adopting new technologies like electric propulsion, in-orbit servicing or smaller satellites or leveraging different approaches like condosats or multi-satellite contracts, operators can get good economies to continue serving FSS markets. One could eventually discontinue unprofitable payloads and aggregate demand in fewer satellites. At the same time, operators need to think how to continue growing revenues and enter the HTS game. Economies of scale are critical in this segment, for those that cannot afford to invest in large payloads, incorporating hybrid FSS-HTS payloads can be a good intermediate solution to reach scale. Similarly, for smaller actors that do not have the leverage to develop their own non-GEO constellation, venture investments and partnerships like the ones done by Hispasat and SKY Perfect JSAT with LeoSat can open opportunities unattainable with other approaches. Needless to say, investing in proprietary constellations and VHTS systems could generate significant economies of scale and open new greenfield markets, but not all organizations are ready to be exposed to such levels of risk. In the current state of transition, satellite operators need to find the balance between continuing to extract value from FSS markets and getting ready to capture growth from emerging opportunities on HTS. 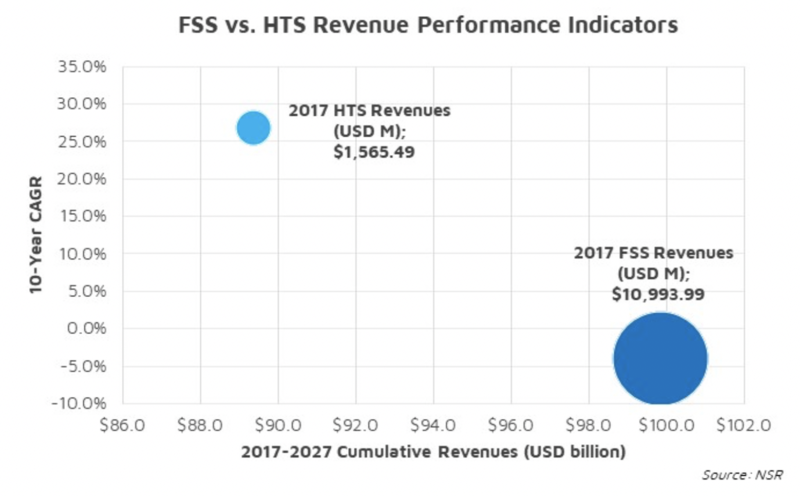 While FSS applications will progressively generate smaller value, the 10-year cumulative revenue is still formidable and superior to that of HTS. On the contrary, HTS will grow spectacularly, becoming the main source of revenues for the industry by early 2020s. Organizational structure and assets must match. Satellite operators will need to adapt to the HTS environment. From sales channels to networking or investment profiles, the transformation must be profound. The options for fleet planning are more open than ever for satellite operators. Each satellite must find its own economic raison d’etre. 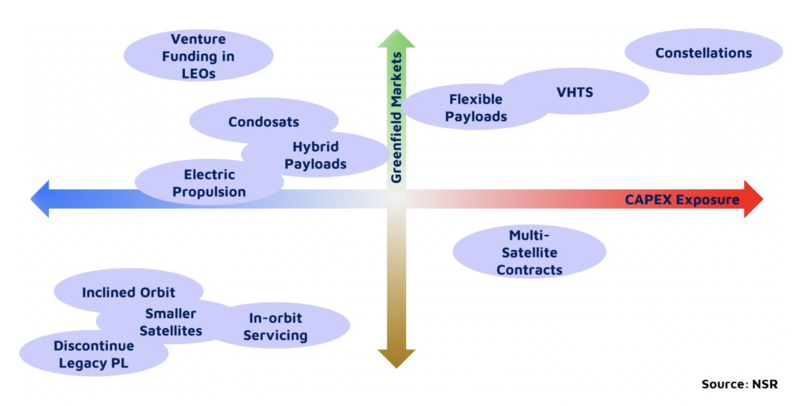 A number of innovative approaches like VHTS, hybrid payloads, smaller satellites or in-orbit servicing allow operators to be more flexible when balancing CAPEX exposure, greenfield markets and ROI expectations.